Turtle shell, conventionally, is considered an outer covering for protection and lodging for the animal. Till date, turtle is the only living vertebrate with such a sturdy broad ribbed proto shell. However, recent study of fossil turtles, which happen to be around 260- million-year-old, has revealed that the hard and rigid protective structure of the animal is not adapted for protection rather for digging underground. Dr. Lyson, the scientist behind this discovery said that during the early (evolutionary) phase, birds’ feathers too were not employed for flying. Nevertheless, birds starting propelling their feathers with the change in the evolution phase to accommodate adaption. In the same way, fossil record of turtles suggests that the shell was primarily meant for tunneling into ground for escaping bad climatic conditions. But now the shell has transformed into a casing for protection. 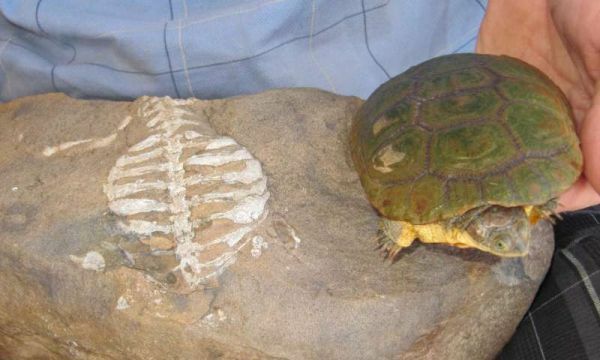 Evolution of turtle shell has been a topic of question for paleontologists since long. The only change that they had observed was the widening of ribs, which however, wasn’t a significant factor for such a huge modification. Ribs, across vertebrates, are used for supporting body during locomotion and facilitating breathing by enabling lungs to expand in chest cavity. Distinctly wide ribs increases thoracic rigidity that shortens stride length thus decreasing the locomotion speed, consequently inhibiting breathing. However, the latest turtle fossil suggests that the skeleton of early turtles (Eunotosaurusafricanus, from the Karoo Basin of South Africa) had very well defined hands with spatula shaped claws, which could be used for tunneling through ground thus by-passing harsh climatic conditions. And accordingly, they might have survived the Permian/Triassic extinction as well. One question that still looms is, if the shell in turtle is the result of fossoriality then why didn’t the other burrowing animals’ torso morph into similar shell.